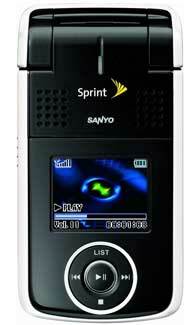 Sprint has launched another music phone, the Sanyo M1. While the recent trend has been to launch music oriented handsets with limited memory (relying instead on a memory card slot and user upgrades), the M1 sports an impressive 1GB of internal memory. That's the most internal memory of any phone on a national carrier, but there is no expansion slot. At 23mm thick (.9"), the phone is a bit chunky when compared to other recent music phones. Sprint is selling the Sanyo M1 for $199 with a new 2-year contract and $150 in instant savings. It's available now. Another photo of the M1 is available below.